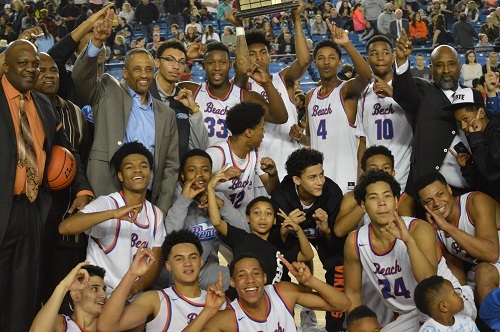 Fresh off their Les Schwab Invitational championship, top-ranked Nathan Hale returned to league play in 2017 to take on O’Dea. The packed gymnasium was brimming with anticipation to see the high-flying Raiders take on the reigning state runner-up. In the opening moments, PJ Fuller started the high-scoring affair with a quick 7 points as part of a 31 point first quarter. The tenacious Hale defense matched their unstoppable attack forcing turnovers and setting up Michael Porter with some high-flying slams and pinpoint shooting. The 6’9 senior logged an impressive 52 points and 15 rebounds in the contest. 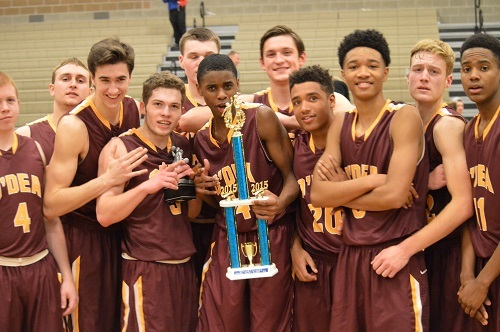 O’Dea battled until the final whistle despite being down big early on including strong efforts by talented sophomore Noah Williams who scored 28 tough points and Xavier Smith who tallied 21 in the game. When the dust settled, Hale rang in the new year with a dominant 42 point win. 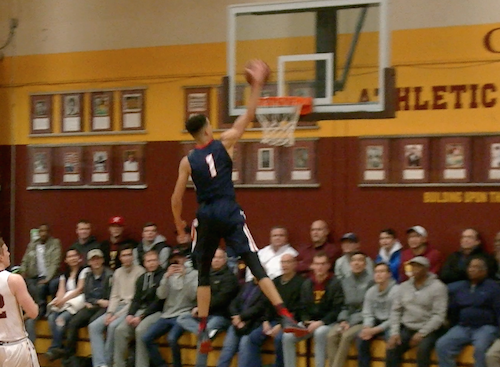 Nathan Hale 110, O’Dea 68. 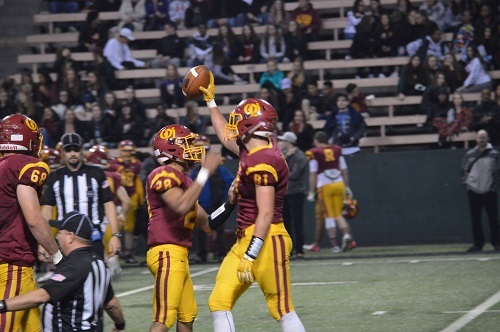 In a rematch of week one between the O’Dea Fighting Irish & Lincoln Abes which O’Dea prevailed 31-14, the winner of Friday night’s game at Memorial Stadium would punch their ticket to the state semis. 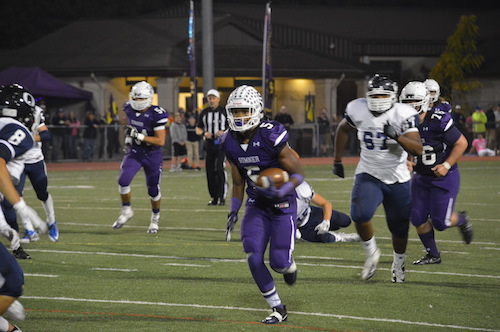 Lincoln worked the opening possession down the field effortlessly until they reached the one yard line where they were stopped and held scoreless. The Irish countered with a touchdown drive capped off with a 36 yard Hunter Franco run. The momentum swung in Lincoln’s favor midway through the first half when a fourth down stop led to a Ben Malietufa run to the endzone to tie the game. LHS even had a chance to take the lead when they regained possession. 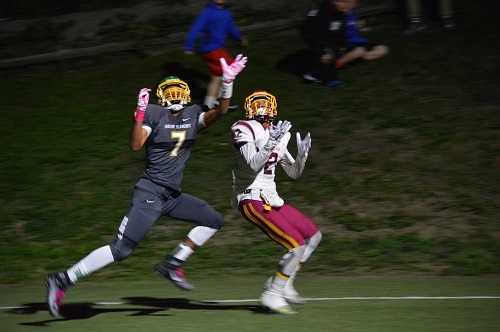 However, a forced fumble gave O’Dea the ball back and before the half concluded, Ben Beale found a wide open Sam Sanchez to give the Irish a 14-7 lead heading into the break. When play resumed, Jamyn Patu earned a heavy dose of O’Dea touches and found an opening from 19 yards out early in the third to put his team up 21-7. The Abes returned the favor by marching down the field and punching it in from two yards out by LJ Lovelace. Patu struck back with another touchdown to retain the two-possession lead, could Lincoln keep pace? 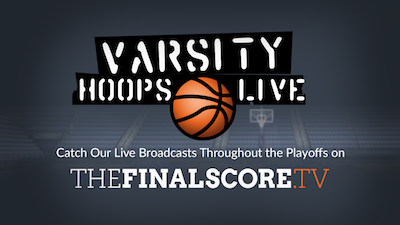 Joey Sinclair took to the air and found a heavily covered Kavon Holden who hauled in a tremendous grab to bring the score back within one possession. 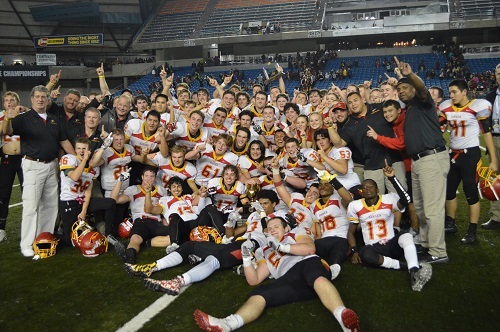 With the clock winding down, the Abes found themselves with an opportunity to tie up the game, but a big stop by O’Dea tough defense was enough to finish the Abes comeback threat. 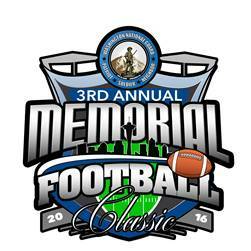 The Fighting Irish return to semifinal weekend under Monte Kohler illustrious tutelage still in heavy contention for another state title. 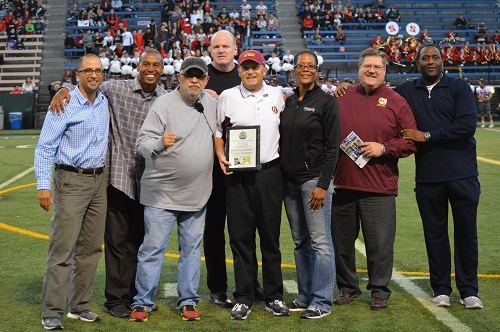 The Friday nightcap of the Memorial Classic matched the Shelton High Climbers of the newly created South Sound Conference against O’Dea whose legendary Coach Monte Kohler entered with a chance to cross a significant milestone which is 300 career wins as head coach of the Irish. A slow start for both teams was the result of tight defense and erratic passing attempts from each offense. 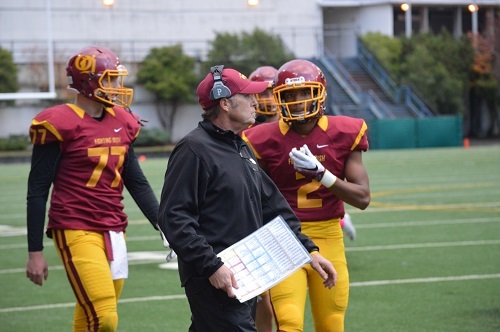 O’Dea struck first when their staunch offensive line opened a massive running lane for Parker D’Anna allowing the junior tailback to glide to the endzone. 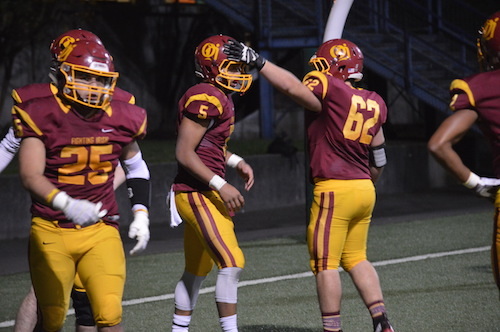 Minutes later, Connor Gregoire benefited from the same treatment for a touchdown of his own adding to O’Dea’s lead. Shelton recorded six before the break, but had an uphill battle in the second half. 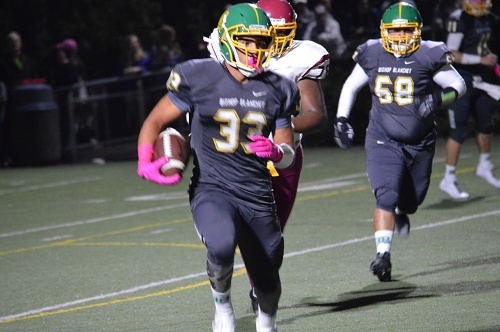 The second half can be simply classified as ‘The Hunter Franco Show’ as the senior running back busted loose three times for long touchdown runs of 47, 51, & 44 yards respectively. 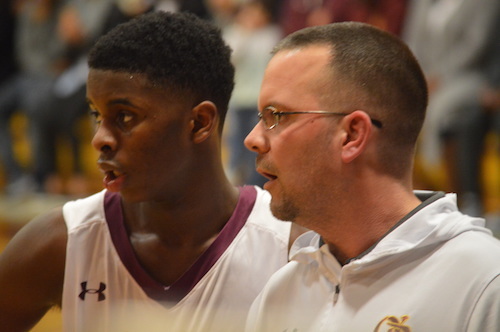 This outburst proved too much for the Climbers when paired with the Irish defense clamping down in the final two quarters without allowing Shelton to score. 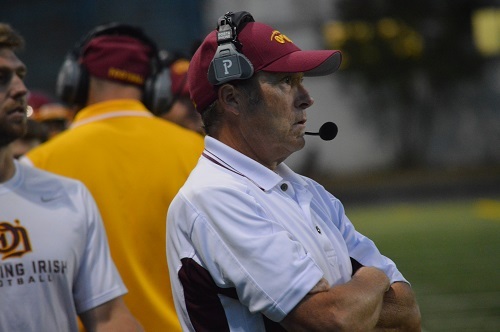 At the end of the night, O’Dea moves to 2-0 and Coach Kohler earns win number 300 of his legendary coaching tenure.